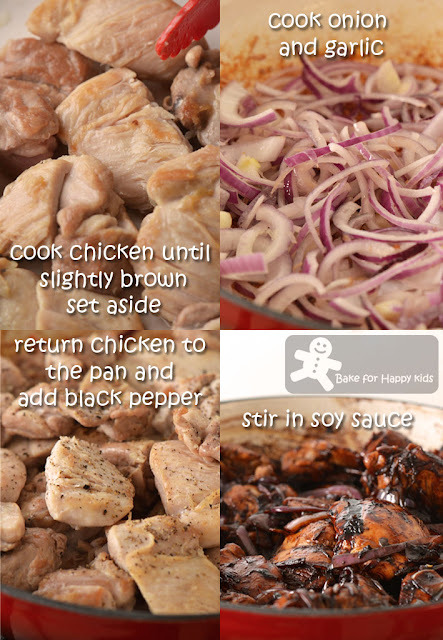 I have been seeing this Bill Granger's Caramel Chicken recipe everywhere!!! 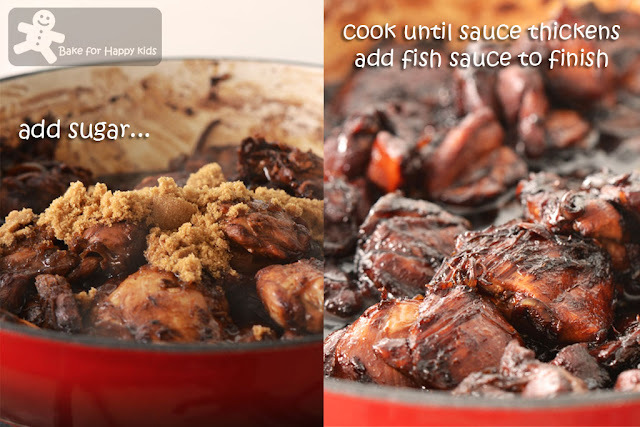 I'm seeing it at these books, Best of Bill and Bill Cooks for Kids by Bill Granger and here too... Clearly, Bill Granger likes his caramel chicken recipe very much and publishes this recipe everywhere. Assuming that Bill really really like this recipe very much, I would have to trust Bill Granger's choice and preference. Like me, Bill Granger is a self-taught cook but unlike me, he is a famous restaurateur and food writer. - LOL! According to Wikipedia, the Australian Bill Granger finds his inspiration in many city's lifestyle, light and harbour views and successfully displays his style in his simple cooking, shows, books and restaurants. I like to agree with Wikipedia which refers Bill Granger as the Australian version of Jamie Oliver. Bill Granger same as Jamie Oliver??? I know that I will initiate an endless series of debate making this statement. Let's put their looks and charms aside. To be fair, I like to think that both Bill and Jamie are similar being super-stylish with their so-simple and delicious cooking. 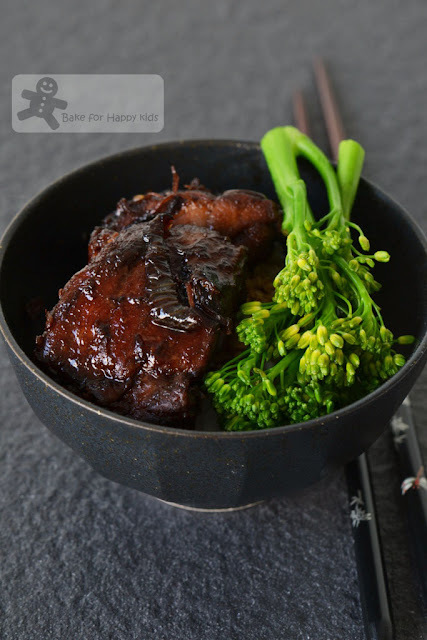 To start learning to cook like Bill Granger, I like to try this Bill Granger's Caramel Chicken recipe that I have been seeing everywhere! Have I been hypothesized? - I think so!!! In order to cook this chicken dish with the most ultimate deep caramel flavours, I reckon you need good quality dark soy sauce. Being a Singaporean, I'm picky with the dark soy sauce that I eat and don't seem to find any thick and good quality ones here in Melbourne. The dark soy sauce that I bought from most Asian grocery at Melbourne are usually very disappointing as they are usually not viscous in texture and not rich at all in its taste. You know what... the desperate me can't even find any good quality dark soy sauce in Sydney too. I wonder what kind of soy sauce Bill Granger used??? Nevertheless, I buy my bottle of best quality dark soy sauce every time I goes back to Singapore and this is what I used to cook this dish. True enough that this is one of the Asian-fusion recipe that my family and I would highly recommend, especially made with the best dark soy sauce that I can never find at Melbourne - please pardon me and my irony. 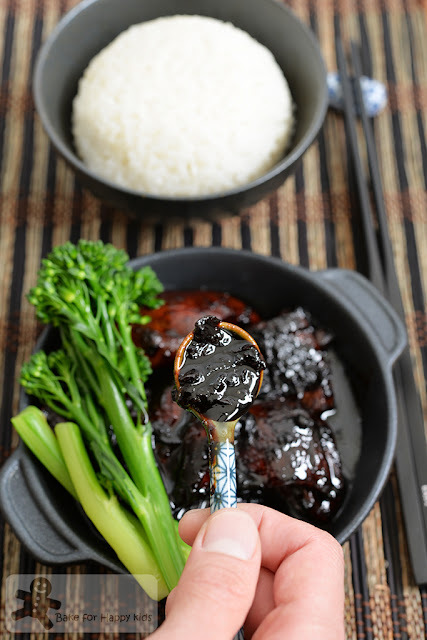 If you can't find any thick and rich dark soy sauce at the place that you live, you can still cook this dish with similar ultimate deep caramel flavours and this is what I would suggest... substitute half amount of dark soy sauce and the added sugar with any dark caramel cooking sauce and I reckon the texture can be quite the same. I like to recommend these sauces to cook this dish. More flavours from brown sugar and fish sauce! Cooking this dish is easy. Cover the pan and cook for another 10 minutes. 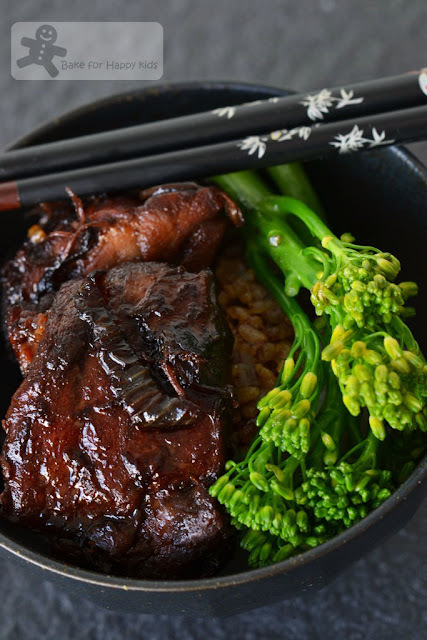 We like to eat this caramel chicken with Japanese rice and steamed broccolini. Now, we are enjoying this! Update on 26 July: We love this Asian-fusion chicken dish so much that I have to cook it again... and again!!! 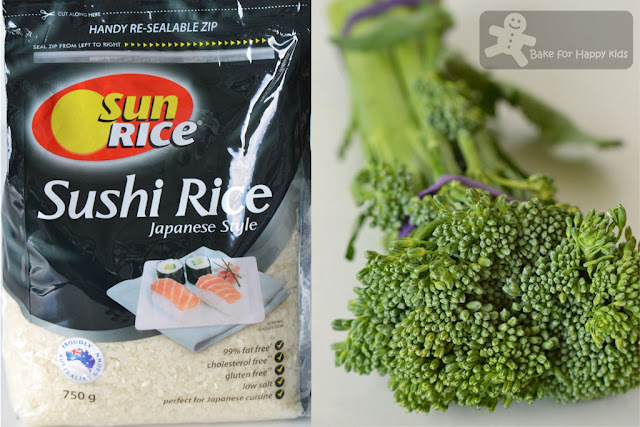 ... and it is so comforting to eat with the vegetable, chicken and steamed white Japanese rice. Must cook this! Must cook this! Must cook this!!! Here's a video showing how I cooked this easy awesome flavoursome caramel chicken. Here's the recipe that is adapted from the books, Best of Bill and Bill Cooks for Kids by Bill Granger and here. 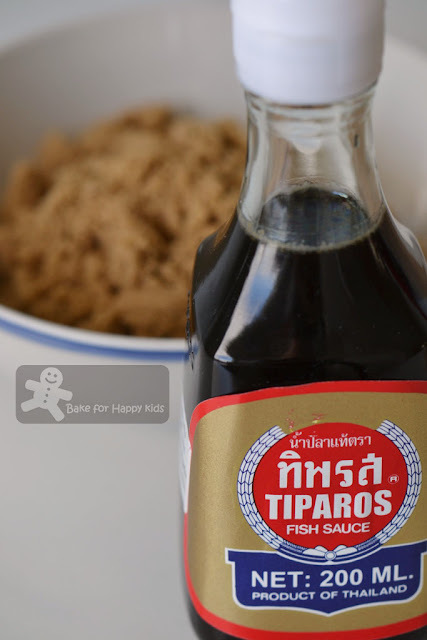 60 ml (1/4 cup) Thai fish sauce, or less if the brand that you are using has high sodium content. * Note: I used the premium very thick and viscous one. 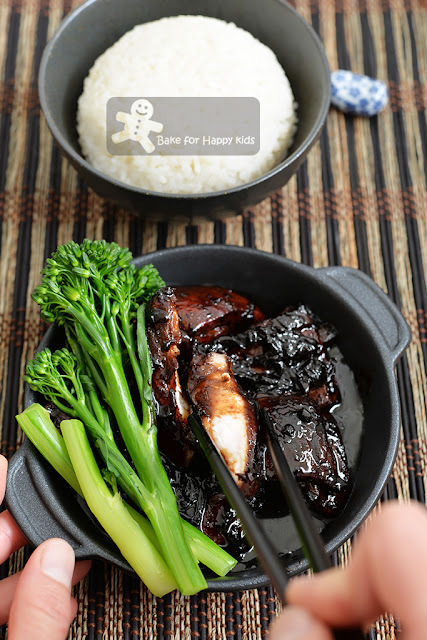 If premium ones is not available, you can substitute half amount of this soy sauce with caramel cooking sauce and use half amount of any regular dark soy sauce. If you are doing this, remember to cut down the amount of sugar added to 1/4 cup or adjust the sweetness according to your taste. Place the chicken and oil in a bowl and toss to combine. 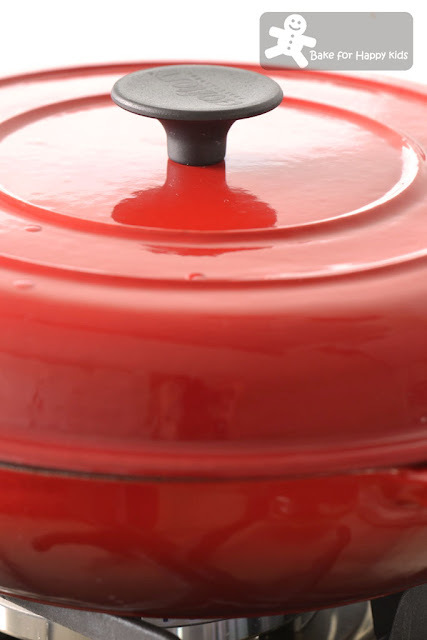 Heat a large frying pan over a high heat until hot. Add half the chicken and cook for two mins on one side until lightly browned, turn and cook for another minute. Remove from the pan and repeat with the remaining chicken. Reduce the heat to medium and add a little extra oil if needed. 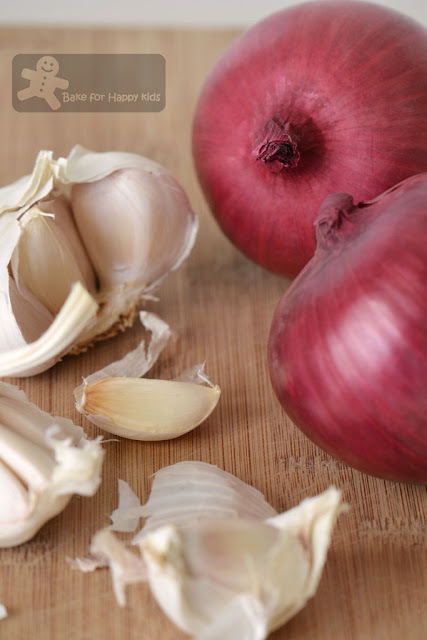 Add the onion and garlic and cook for five minutes, stirring occasionally. Return the chicken to the pan, season liberally with black pepper, add the soy sauce and stir to combine. Cover the pan, reduce heat to low and cook for 10 mins, stirring occasionally. Increase the heat to high, add the sugar and stir to combine. Cook uncovered for 3-4 mins, or until the sauce is rich, dark and syrupy. Add the fish sauce and stir to combine. 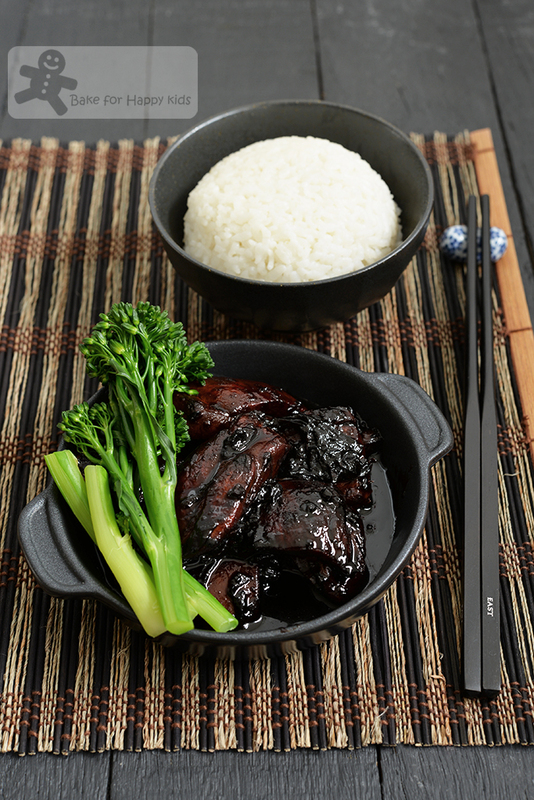 Place in a serving dish and serve with steamed rice and green vegetables. YES I WILL COOK THIS, YES I WILL COOK THIS, YES I HAVE BEEN HYPNOTISED. That looks delicious. Reminds me of a Donna Hay dish I made recently. Hahhaaaa..I thought it was my PC lagging issue when I saw you trying to hypnotize us. Your caramel chicken looks really good!! You don't even need to hypnotize me, I think I will definitely try it out one day for my little kid. I'm indeed convinced after looking at all your pics here.....one pic after another....use this if not use that....just fantastic. Yes, I have seen this recipe and it is already in my long list of to-try! It looks delicious, and I think that my kids would like this dish. Will be linking up soon. Oh, i just saw "cook this cook this cook this......" the chicken look very shiny & yummy! I loved reading this post! I make Bill's caramel salmon a lot and yet have never made the caramel chicken despite having the recipe in one of the many books of his I own. Reading this has prompted me to finally cook it as you make it sound so good! Zoe, you definitely stoking my interest for this caramelized chicken. It really looks very very good. Haha, I think it's a Singaporean thing with the sauces that we are indeed picky about the sauces we use in our food because I feel the same way too. I make something similar with chiles in my house. It's a big hit. I am already being hynoptised by Bill Granger, Bill Granger's Nottingham is screening on BBC lifestyle now and your caramel chicken. Must try this! I can actually imagine how it tastes , yummy! 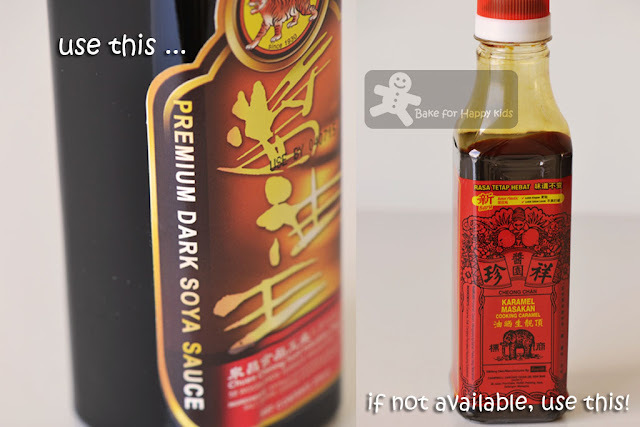 The dark soy sauce doesn't contain any potential infectious agricultural diseases and bring it through the Australian quarantine is not a problem at all. The only thing is you can't hand-carry this fragile item and can only check-in it in your luggage. Cheers! This looks totally delish! This is somewhat similar to a Vietnamese dish I know. Love the looks of yours! Really good job - thanks. i was chuckling when i saw your writing there COOK THIS COOK THIS COOK THIS..this must be darn good! now that you hv mentioned, i too wondered what kind of soy sauce did he use and also what kind of soy sauce do most westerners or angmohs use..really no idea..could be kikkoman too since it is quite a well known soy sauce across the globe. Looks super delicious! OMG I love these! 2 bowl of rice for me..
Hi Zoe, haven't visited for a while. Full time work is taking its toll on blogging! I love Bill Granger's recipes though and intend to take part in this month's 'Cook like a Star'. I have already made this caramel chicken and it is a wonderful, wonderful dish. It looks especially delicious here! Oh! Now, I am being hypothesize by Zoe the magician...... COOK THIS! COOK THIS! This looks so good. My kids would love these.